Sometimes it's just too darn hot to turn on the stove. That's where cold lemon zoodles (aka zucchini noodles) come into the picture. A light dressing and no actual cooking required make this an ideal substitute for summery pasta salad. Oh, and did we mention it comes together in only 25 minutes? 1. In a small bowl, whisk the lemon zest, lemon juice, mustard and garlic powder to combine. 2. Gradually add the olive oil and whisk to combine. Season with salt and pepper. 3. 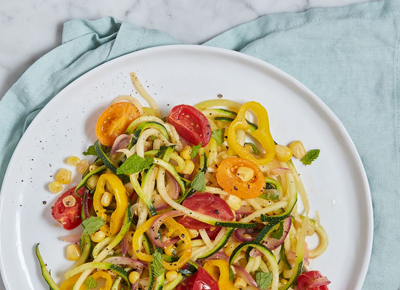 In a large bowl, toss the zucchini noodles with the radishes. Add the dressing and toss until the veggies are well coated. 4. Serve immediately, garnished with fresh thyme.